Red Eared Sliders and other aquatic turtles spend a lot of time in the water, so clean water is essential. Of course, turtles also defecate in their water, so maintaining good water quality can be a challenge. 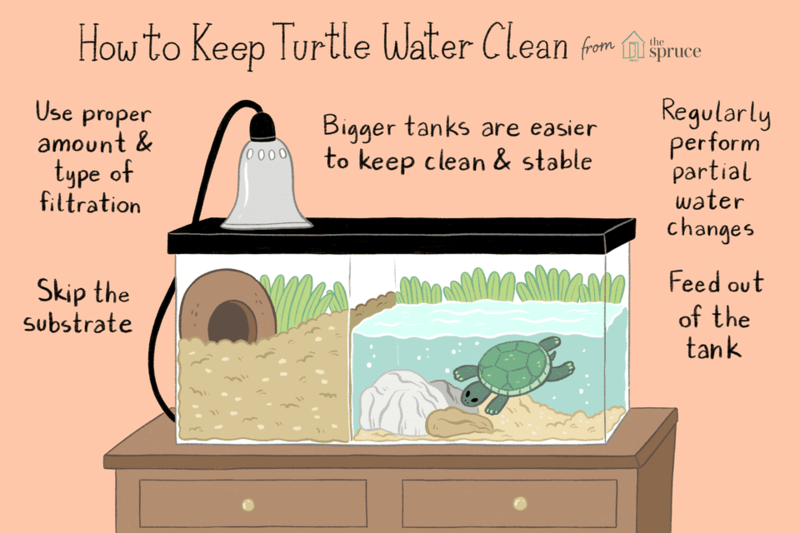 Cloudy and smelly water in a turtle tank is a common problem, but even water that looks clean can harbor waste products such as ammonia and nitrites that can build up to harmful levels. Maintaining good water quality is an important aspect of keeping turtles healthy. Though turtles generally aren't as sensitive to water quality issues as fish, treat turtle tanks much like fish tanks. As waste products in the tank break down, ammonia is formed which is potentially toxic and can be irritating to your turtles even at low levels. As a tank becomes established, beneficial bacteria grow in the tank and filters; some bacteria break down ammonia into nitrites (also toxic) which are converted by other bacteria into less harmful nitrates; these are then controlled by water changes. Before this "nitrogen cycle" becomes established (or if it is upset in an older tank), levels of harmful by-products or the bacteria that use them can spike, causing problems such as cloudy water. Pet stores carry test kits for ammonia, nitrates and nitrites. Monitoring these levels can help you catch conditions in the tank that can be irritating or harmful for your turtles. Check with the pet store and follow the directions included with the kits; the instructions will also have information on safe and dangerous levels of each chemical. If the levels of ammonia, nitrates or nitrites are too high, do a complete water change. If you find your levels are moderate or creeping up, do more frequent partial water changes (or a complete change). The pH (a measure of acidity) is not as critical as the waste products, but measuring pH is also a good idea. Generally, red-eared sliders are pretty tolerant of small pH changes, but picking up on the changes can alert you to changing the chemistry in your turtle's water. The pH should be in the range of 6-8 for red-eared sliders. Pet store products enable you to safely lower or raise the pH if necessary. There are conflicting opinions on whether tap water should be dechlorinated for turtles. Turtles may not be as sensitive to chlorine as fish or amphibians, but it can still be irritating to them (especially their eyes). Chlorinated water may also destroy the beneficial bacteria in the tank, affecting the nitrogen cycle and breakdown of waste products. Thus it's ideal to dechlorinate the water--the easiest way is to use water conditioners available at pet stores. Some cities use chloramine in addition to chlorine to treat tap water; if this is the case where you live, find a water conditioner labeled to remove chlorine, chloramine and ammonia (a by-product of the deactivation of chloramine). Chlorine will dissipate from the water after about 24 hours, but chloramine does not. Be aware of the risks of salmonella and take appropriate precautions when you are changing water, cleaning filters or other turtle tank accessories, and handling your turtles. Water quality and cleanliness are easier to maintain in a larger tank. In a smaller amount of water, the waste products more concentrated. With a larger tank, waste matter and its by-products are diluted. In a larger tank, partial water changes are more practical for maintaining consistent water quality, rather than having to change a large proportion (or all) of the water in a smaller tank. A general guideline often quoted is 10 gallons per inch of turtle. Regularly take out part of the water and replace it with fresh water. This removes and dilutes waste products. The frequency of partial changes and how much water you need to change out will vary depending on factors including the size of your turtle(s), the size of the tank, the filter, and whether you feed in the tank. Frequent partial water changes (weekly or perhaps two to three times a week if necessary) will do a lot to help keep the water quality high. Using a gravel vacuum or a siphon to remove water makes this job a lot easier, but never prime a siphon by mouth due to the risk of salmonella contamination. Keeping the bottom of the tank bare makes cleaning easier since wastes and uneaten food can't get trapped in the rocks. Rocks or large gravel (too big to be ingested) at the bottom of a tank can be attractive but aren't necessary. One way to reduce the amount of waste you need to manage in the tank is to feed your turtle in a separate container, though this is a matter of choice. Try a smaller plastic tub or storage container. Using water from the tank is an easy way to make sure the temperature of the water is warm enough; just replace the water taken out for feeding with fresh water (and you've done a partial water change at each feeding). This eliminates the problem of excess food decaying in the tank, and turtles often go to the bathroom shortly after eating, so the amount of turtle waste accumulating in the tank is reduced as well. Then you can just clean and sanitize the lightweight feeding container after each feeding. However, this is a lot of additional work and the extra handling may be stressful. You may choose the separate feeding tub for messier or higher protein meals, and feed other less messy foods like greens and vegetables in the tank. Many owners decide to feed in the tank too, which is fine, especially with a good system of filtration, water changes and monitoring. Scooping out excess food particles and doing water changes shortly after feeding can also help if you feed in the tank.